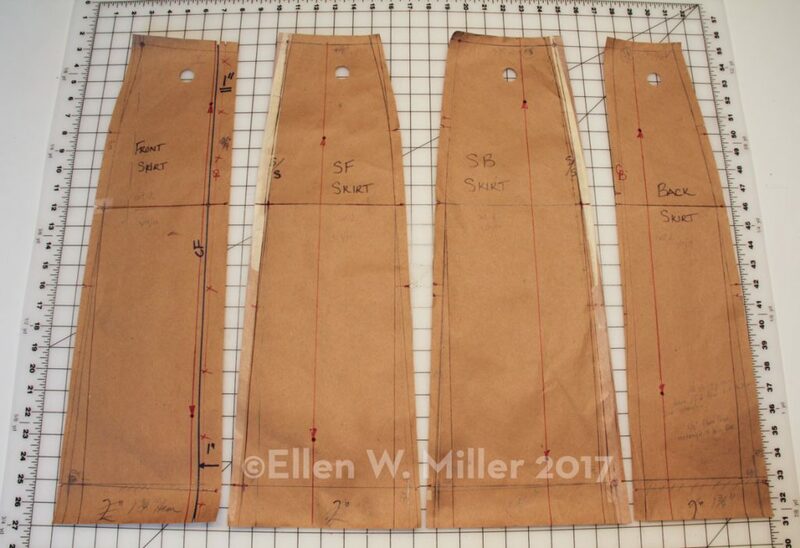 For me, making one’s own clothes requires a well-fitted pattern. As my weight & shape have changed over the last couple of the years I thought it was time to make a basic muslin shell that fits my current body. My friend Martha agreed to help with this project- fitting the muslins and helping me transfer the changes to the paper pattern. 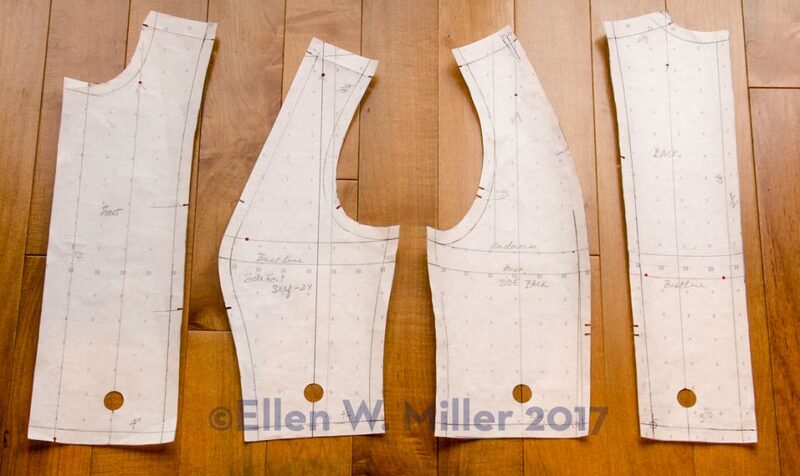 The bodice pattern, adapted by Martha. Martha likes to work on dotted paper; I like to work on brown paper. I have an old Wolff dress form that was gifted to me many years ago; it’s a size 8, which I am not. With the help of some foam pads from Fabulous Fit (www.fabulousfit.com), I was able to pad out the dress form to roughly resemble my shape. 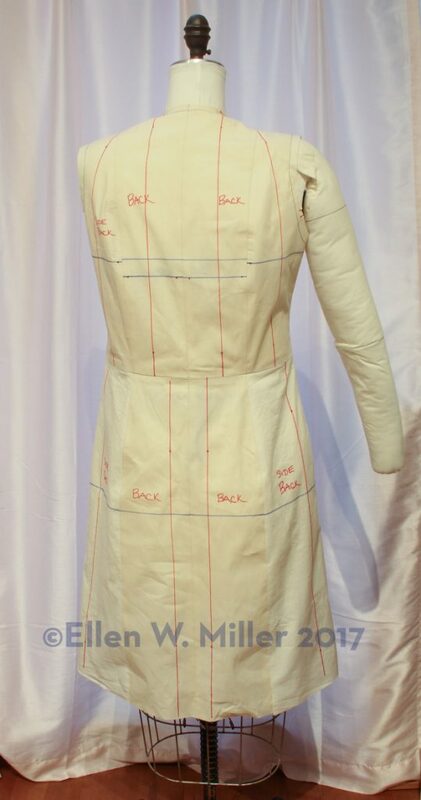 Back view of the muslin on the dress form. This muslin fits me pretty well! Time to add sleeves before making any changes. Clearly some alterations will need to be made to the pattern. Yes, I am crooked; it’s not the photos. All of us are slightly uneven: one shoulder higher than the other, one hip higher than the other, on breast larger than the other, and so forth. For me, my left shoulder is 1” (2.5 cm) higher than the right shoulder. My waist and hips are pretty level. As I look at the photos I can see that the bust curve of the princess line is higher than my bust curve. Also the back is too long between the bust line and waist. Here is the back view with a tuck across the back: much better. There are still some issues with the armholes and sleeves; Martha can help me fix these problems. It’s almost a great muslin!